This article was originally published at NVIDIA's website. It is reprinted here with the permission of NVIDIA. Gone are the days of using a single GPU to train a deep learning model. With computationally intensive algorithms such as semantic segmentation, a single GPU can take days to optimize a model. But multi-GPU hardware is expensive, you say. Not any longer; NVIDIA multi-GPU hardware on cloud instances like the AWS P3 allow you to pay for only what you use. Cloud instances allow you to take advantage of the latest generation of hardware with support for Tensor Cores, enabling significant performance boots with modest investments. You may have heard that setting up a cloud instance is difficult, but NVIDIA NGC makes life much easier. NGC is the hub of GPU-optimized software for deep learning, machine learning, and HPC. NGC takes care of all the plumbing so developers and data scientists can focus on generating actionable insights. This post walks through the easiest path to speeding up semantic segmentation by using NVIDIA GPUs on a cloud instance with the MATLAB container for deep learning available from NGC. First, we will explain semantic segmentation. Next we will show performance results for a semantic segmentation model trained in MATLAB on two different P3 instances using the MATLAB R2018b container available from NGC . Finally, we’ll cover a few tricks in MATLAB that make it easy to perform deep learning and help manage memory use. 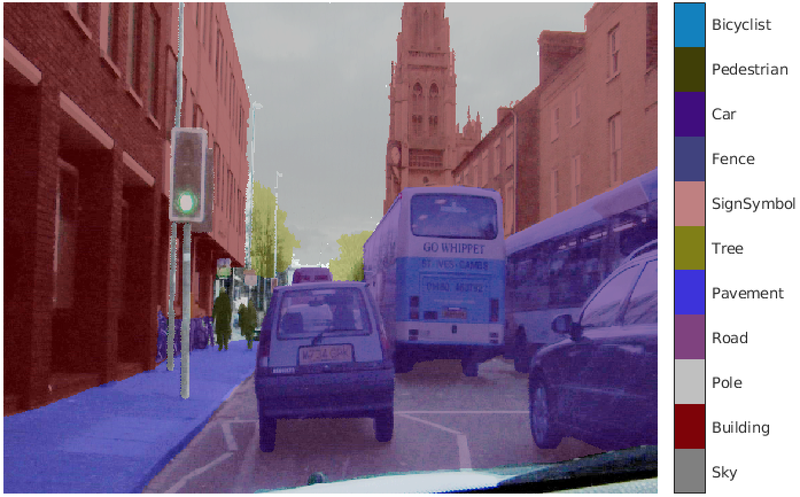 The semantic segmentation algorithm for deep learning assigns a label or category to every pixel in an image. This dense approach to recognition provides critical capabilities compared to traditional bounding-box approaches in some applications. In automated driving, it’s the difference between a generalized area labeled “road” and an exact, pixel-level determination of the drivable surface of the road. In medical imaging, it means the difference between labeling a rectangular region as a “cancer cell” and knowing the exact shape and size of the cell.